Meet Brian Lorusso, who serves up creative cocktails at Dogwood Southern Table & Bar. 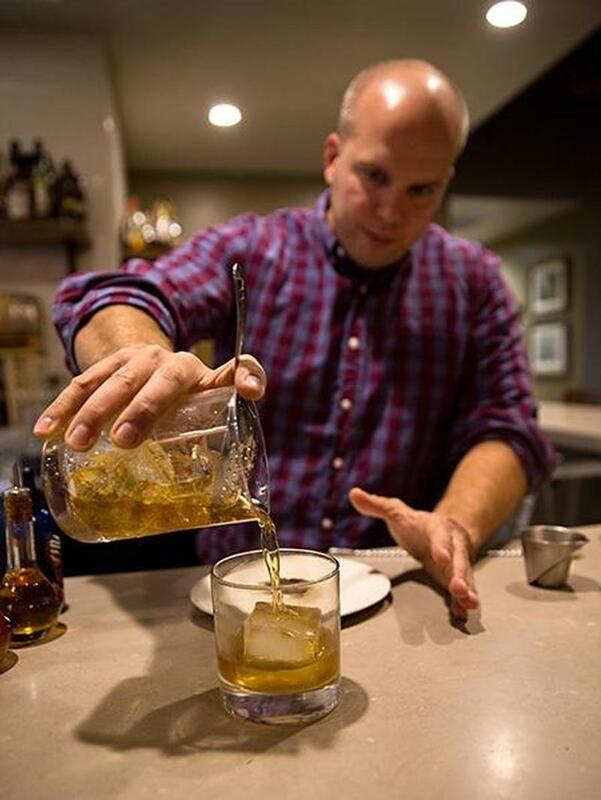 IF BRIAN LORUSSO, bar manager atDogwood Southern Table & Bar, were a cocktail, he’d be an old-fashioned. And although he makes what may be the best old-fashioned in the city, his cocktails are anything but old school. Behind a bar made of corrugated metal and concrete lives a collection of housemade infusions and syrups: gingerbread, autumn, pistachio milk, blackberry gin, ginger beer—a lot of modern flavors, made by this old-fashioned kind of guy. There are whiskey drinks, including the ruff rider (Bulleit rye whiskey, cocoa and coffee bitters, burnt sugar simple syrup, and orange peel), bourbon drinks, gin drinks, tequila drinks, vodka drinks. The drink menu is listed on an iPad. As Lorusso discusses how the Winter Mule is made, he mentions he’s not big on crazy names for drinks. With his titles, you know what you’re getting. The winter mule is a seasonal play on the Moscow mule. Simple. At 34 years old, Lorusso has worked with Jon Dressler and his restaurants for 12 years, moving over from Dressler’s to open Dogwood in 2014. There is continuity in the way Lorusso imagines cocktails and executive chef Scott Hollingsworth plans the menu here; the restaurant’s dishes have a Southern influence and layers of flavors, yet remain unpretentious and approachable. Each of those words describes Lorusso, who should be among the city’s best-known bartenders. Yet Dogwood’s crowd remains mostly SouthPark residents. On a recent Friday at 2 p.m., several regulars are already drinking at the bar. Lorusso, his friendly eyes darting from bottle to bar, is wearing a red-and-blue-checkered button-up shirt. The color brings out the red in his cheeks, flushed with concentration, as he makes the rounds with more rounds. He has just 85 followers on Twitter and posts on Instagram only a few times a week, but in real life, the guests know Lorusso, and he knows them. They come here to see him. One couple jokes with Lorusso about being interviewed for this article, and, for a minute, he seems like he might blush. His cocktails deserve the attention, but Lorusso won’t seek it, and the SouthPark location keeps him protected from it. Lorusso prepares to smoke the inside of a glass with Ceylon bark. Get a taste of Dogwood’s bar program at home. Lorusso has several bitters he’s made in collaboration with Crude Bitters out of Raleigh. Find them at Savory Spice Shop in South End. Lorusso brings over a plate of drink accoutrements for me to sample, candied oranges and cherries. They may seem like just a garnish, but each slice of orange is boiled in simple syrup, covered in aromatic bitters, and then sprinkled with sugar and baked before it hits a glass. I pick it up and take a bite, rind and all. The rind has become tender, and holds the most citrus flavor. These touches—the syrups, infusions, and fruits—allow the Dogwood staff to have a full bar and still serve quality cocktails without taking longer to refill a glass than a customer takes to drink it. Lorusso recalls a trip to Charleston with his boss while they were researching the Dogwood concept. There, he had an epiphany. Lorusso, Dressler, Hollingsworth, and general manager Tim Buchanan were eating at the bar of McCrady’s, Sean Brock’s renowned restaurant. As the bartender described a beef tartare dish, Lorusso was struck by the effort that went into one appetizer. With so many tempting options, the easiest decision at Dogwood may be to order the Barkeep’s Call. Simply give the bar staff a few tips on what you like, and they’ll shake or stir a fitting match. There were more than 500 ordered in the restaurant’s first year (its one-year anniversary was in November). “It’s more of an honor than anything else—they trust you to make a great drink,” he says. Lorusso gestures to his old-fashioned, adorned with the brandied cherries and candied orange. It’s his interpretation of the Charleston dish, a cocktail with a complexity that you don’t know about until you ask. “I’m really proud of this,” he says. He turns to visit his regulars, chatting like old friends, while I sip the old-fashioned. The burnt simple syrup unites the flavors in the glass, hints of the citrus hiding the sting of bourbon. Lorusso, still a few seats over, rests one hand on the bar surface, saying goodbye to two women who are about to leave. After he listens to their stories and tells his own, it’s clear that these customers—like so many others— leave with a true connection to Lorusso. His drinks, like those he is barrel-aging for months, are cutting-edge. But certainly, Lorusso is an old-fashioned bartender. Kristen Wile is senior editor of this magazine. Reach her at kristen.wile@charlottemagazine.com or on Twitter: @kristenwile.